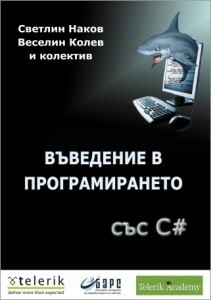 With no doubt for the Java web-applications development the Eclipse and Tomcat are default choices. I usually prefer to use preinstalled Tomcat, configuring Eclipse to use the already installed instance. In this case though, by default, Tomcat logging does not work. This in most of the cases is quite anoying, as we don’t want to return in the dark ages of System.out.println() (which adds another argument to Misho’s request for improving the integration between Eclipse and Tomcat). When I’m configuring Tomcat, I prefer the configuration files to be located in the server’s directory. When the server is launched by Eclipse though, it’s not that easy. drwxrwxrwx   1 user     group           0 Aug 29 17:23 .
drwxrwxrwx   1 user     group           0 Aug 29 17:23 ..
Again, similarly to the standard Tomcat installation, we place the Log4J configuration file log4j.properties in the folder conf, perform the steps from the previous section and voilà, the logging is enabled. Sooner or later, after a couple of reinstallations of the operating system, each of us reaches the conclusion that the user applications should be installed to a partition/hard-disk, different from the system one. 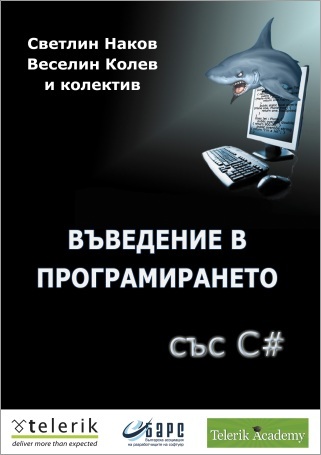 On the other hand, the default configuration of most of the applications by default rely on the fact that the installation of that program is done on the system partition (at least under Windows). That’s the case of Eclipse and Maven as well. If we install Maven in a location different from the one by default and we configure the local repository to be on a directory different by the one indicated by default, what we could expect is the installation of the generated by Maven archives (jar, war, etc.) in the local repository, to be placed on the newly defined place. 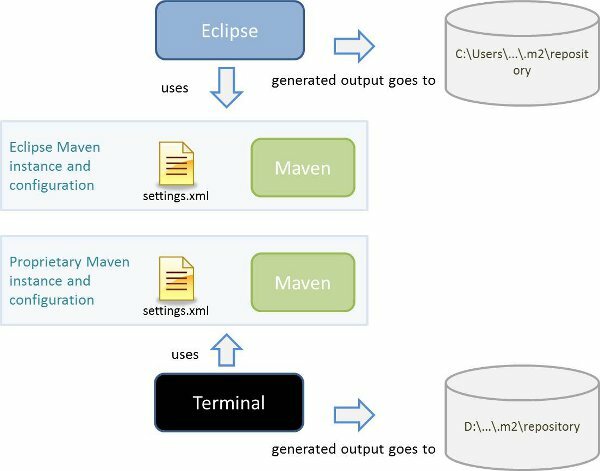 If we don’t reflect these changes in Eclipse, it will use its own Maven installation and its own configuration for the local Maven repository. Respectively, if Eclipse does not find the folder.m2/repository in the current user’s directory (user.home) usually on the system partition/hard-disk, Eclipse creates that folder and install the generated archives for the built Maven projects in it. Thus, the building and installtion (in the terms of Maven) of the same projects from the command line and Eclipse will cause the creation of archives on two different locations. Moreover, not always the Maven version, which Eclipse uses (M3 in the case of Eclipse 3.6.1 for example) coincide with the one, which is used for the current project (M2 for the project, which I am working on at the moment). 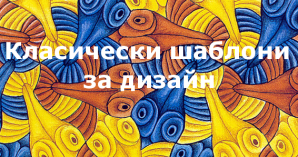 As we know, because of the improvements of Maven in version M3 with regards to the optimisation of its performance, the Maven projects, built with this version are incompatible with M2 and vice versa. Again we save user generated files on the system partition/disk (the ones generated by Eclipse). We don’t have synchronization when we build and install the Maven projects through the command line and the IDE (the projects built and installed via the command line does not bring changes in Eclipse). It’s possible the archives generated via command line and Eclipse to be incompatible. Indicating in Eclipse to use the new Maven installation: Maven > Installations > Add... and chose the directory, %MAVEN_HOME%, which points to the new Maven installation and which will be used through the command line. 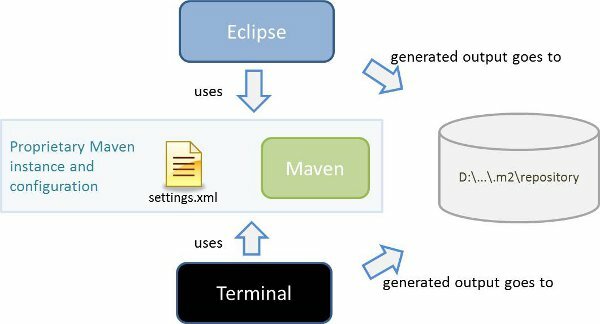 Configure Eclipse to use the new Maven repository: Maven > User Settings > User Settings > Browse and chose the location indicated in settings.xml configuration file of Maven, which describes where is located to the new local repository (explained in the prvious section). In that way we unify the Maven versions and local repository used via the command line and Eclipse.